Take a look at these DIY Pottery Barn hacks and craft ideas! You can get the same beautifully simple and rustic room decor for a fraction of the price. No more sticker shock, just pure Pottery Barn style! Hello, Sovrn! Make your own home look straight out of glossy Pottery Barn catalogs. I've DIY headboards and DIY coffee tables, or choose from the smaller craft ideas to start like the mason jar lights or a DIY mirror. I’ve even included some kids bedroom ideas they’ll love. So whether you’re looking for DIY lighting ideas, crafts to add to your room decor, or DIY furniture with awesome storage additions, this list of Pottery Barn hacks has something for everyone! A beautiful pendant light enhances any room's character and style, but designer pendant light can be very costly. Beat all odds by creating this DIY mason jar pendant light. It boasts a vintage charm that will captivate anyone who will see it. You’ll surely love this rustic wooden headboard. The rustic appeal is simply astounding. And the best part is, it can be done at any skill level, so novice DIY-ers rejoice! This is one of the best Pottery Barn hacks around! Surely this upholstered headboard and bed frame will make your bed more attractive. With a very easy to follow tutorial for every level of DIY-er, you'll love to recreate this hack for your own bed. If you're racking your brains for an idea for a divine decor without breaking the bank, you're about to have a Eureka moment. This rope chandelier will have everyone’s jaw drop once you hang it in your house. It's fabulously beautiful! This DIY blanket ladder will surely save you a heap of money. The maker of this amazing DIY only spent $5 and took only less than 30 minutes to complete. An expensive and relatively quick project to add some unique extra storage in your home. 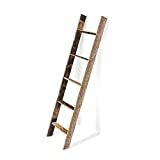 RUSTIC LADDER SHELF FARMHOUSE DECOR; 5' long, mount horizontally or vertically. ENVIRONMENTALLY FRIENDLY; Crafted from 100% reclaimed and recycled wood. *Will have a raw edge on the back of the ladder. COMES FULLY ASSEMBLED -- Nothing to build, and no complicated instructions. LOOKS GREAT IN ANY HOME; Hundreds of five star reviews from other customers! You’ll definitely love this simple, sturdy, and stylish coffee table with storage baskets. A coffee table like this is bound to become a standout piece wherever you put it. Don't worry about your DIY skills because the creator swears this can be built in a breeze. Don't let this incredible console intimidate you! The amazing DIY-er who made this transformed an Ikea piece into a masterpiece inspired by a Pottery Barn media stand. 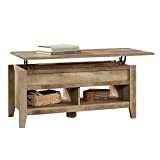 An entryway must have an impact to create a lasting first impression, and this rustic console table is a must have in every entryway. This gorgeous console table was inspired by Pottery Barn Griffin Console Table and if you’re going to purchase it, it will cost you an arm and a leg. So why not make your own console table? If you're stuck with a medicine cabinet in your bathroom, don't settle for plain and boring! You can have one that adds a bit of personality and style, just like this charming DIY Pottery Barn inspired medicine cabinet. FITS IN SMALL, UNDERUTILIZED SPACES: Slim, yet tall cabinet enables you to gain a tremendous amount of storage in a space that would otherwise be wasted behind almost any standard door. CUSTOMIZABLE INTERIOR: Adjustable shelves and rods move up and down, or can be removed to adapt to your unique storage needs. Use all shelves to store small toiletries, or remove them to store tall items like gift wrap. The center shelf is fixed. INSTANT ORGANIZATION: Declutter a messy counter top in minutes without sacrificing easy access to what you need. Items stored are easily accessible, and highly visible. No need to dig through layers of stuff in bathroom or kitchen cabinets & drawers. In need of a great storage for your little crafting supplies? Does this cubby organizer appeal to you? It's an awesome project and one can be useful for so many things. Aren't these Pottery Barn hacks amazing! I'm so in love with this knock-off! It's epic! The chairs got a vintage update without a sky-high price. Would you believe these beauties only cost $40 per chair? Where can you have such beautiful chairs for that price? Only if you DIY it! This wine bottle sleeve will add more value and turn your wine bottles into something more interesting. But don't limit yourself to just one purpose for this amazing hack, use your imagination to repurpose this on other great stuff. These stackable kitchen crates are not only inexpensive and easy to replicate, but they are also versatile. I mean, doesn't this make the perfect storage for almost anything? This ruler growth chart will captivate you and your family with its rustic appeal. It will not only measure the progress of your kids’ height but it is also a good addition to the aesthetics of your home. $99 for a set of four number pillows is somewhat expensive for a penny-wise type of person. Why not make your own number pillows and save every penny you've got! Recreate this stunning glass bottle lamp and it will illuminate your home in style. This awe-inspiring project is bound to become your home decor's focal point. This is one of my favorite Pottery Barn hacks on this list. This wooden writing table unmistakably caught my eye! So for all writers and DIY woodworking enthusiasts, this is a must-try project. This huge rustic clock will instantly catch the eyes of anyone who will see it. A truly appealing decor that will be a great addition to any living room. These mirrors can cost up to $699! I just can’t picture myself spending that kind of money on a mirror. I’m pretty sure some of you guys won’t either. Good thing there are amazing DIYs for these mirrors. Whip this up one weekend and you'll have yourself a vintage locker you'll love bragging about. You can use it with anything you want but if you got kids, I recommend using this as your kids' storage locker and teach your kids how to be organized. Pottery Barn sells these moss letters for $79 a piece! Whoa! That’s way out of budget, but worry not because you can DIY it. These DIY moss letters make an excellent alternative to its costlier version. If you've been dreaming of having the Pottery Barn's farmhouse bed but it's too heavy on the wallet. Well, rejoice because you can now recreate it at just a fraction of the cost and turn your bedroom into a comfy haven with a real rustic country appeal. Is your mantle aching for some oversized love? This oversized sand dollar decor will look perfectly fine on a mantle. It’s inexpensive, easy to do and makes a fascinating addition to your home decors. This triple tiered stand will help you organize your kitchen or workplace even better. A great project for any kitchen hotshot and gracious hostesses. It's so adorable and can be used for a great variety of things. How stunning are these?! These wooden crates will not only provide extra storage but it will also add a little rustic nautical appeal to your home. Your kitchen table will experience an awesome transformation with these exquisite placemats. These easy jute placemats are stunningly lovely on the table and it's super easy to make. If you've got a couple of large mason jar lying around, it could have a wonderful new lease on life. Turn them into outdoor lanterns inspired by Pottery Barn's Hyannis lantern. Light up and transform your patio into something more extraordinary with these DIY outdoor summer lanterns. I think everyone would love to have a media center that is not just a statement piece but also provides a bit of an extra storage. This Pottery Barn inspired media center will give both, remarkable appeal to your living room and a little space to stash away odds and ends. Add more decor and make your living space a more interesting spot with these decorative balls. Recreate a few to cover every inch of your home, any way you can easily customize it to match your existing home decor. This Pottery Barn bingo is perfect in every way! You can keep it for a vintage-style decor or perfect gift that will surely win a smile from the recipient. I fell in love with this knock off clock table as soon as I saw it. It provides a whole new twist to home decor and will add a bit more of aesthetic and rustic appeal to your home for a long TIME! Make your old mirrors more interesting by adding rope around it. It's very simple to make and you’ll see the noticeable improvement in your home. With just $16, you can make the Pottery Barn knock off kid's oars decor. It's a fun, whimsical piece perfect for your kids' bedroom or playroom. Your sons will absolutely be bedazzled when he sees this baseball scoreboard in his room. You don’t have to buy an expensive one. You can make one on your own and don't forget to customize it to your son's favorite baseball team. And last but definitely not the least! Do you want every corner of your home smell like Pottery Barn? Well, you can also DIY it, grab your pot and simmer some lemon, vanilla, and rosemary. Mmmm, I am starting to smell it! Aren't you loving these Pottery Barn hacks? Admit it or not, Pottery Barn has lots of gorgeous pieces for the home, but sometimes these amazing things are just way out of our budget. Luckily, there're tons of great DIYs to choose from. I hope these 35 Pottery Barn hacks I compiled for you will help you have your very own look-a-like Pottery Barn item with just a fraction of the price. Happy crafting! Did you enjoy our list of Pottery Barn hacks? Let us know in the comments section below what your thoughts are on these DIY room decor and craft ideas.